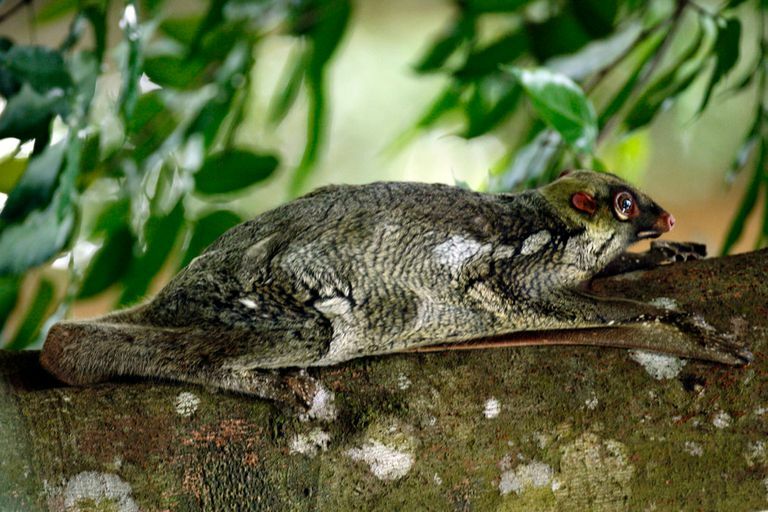 Colugo. Photo © Lip Kee Yap / Wikipedia. Colugos (Cynocephalidae), also known as flying lemurs, are arboreal, gliding mammals that inhabit the forests of Southeast Asia. There are two living species of colugos. Colugos are skilled gliders that rely on flaps of skin that stretch between their legs to glide from one branch to the next. Despite one of their common names being "flying lemur", colugos are not closely related to lemurs. Colugos grow to lengths of between 14 and 16 inches and weights of between 2 and 4 pounds. Colugos have long and slender limbs, all of which are of about equal length (front limbs are not shorter or longer than rear limbs). Colugos have a small head, large front-facing eyes and small round ears. Their eyesight is very good. Colugos inhabit tropical rainforests throughout Southeast Asia. They are nocturnal mammals that are usually quite shy and solitary. Not much is known about their behavior. They feed on leaves, shoots, sap, fruit and flowers and are considered to be herbivores. Their intestine is long, an adaptation that enables them to extract nutrients from leaves and other plant material which is often difficult to digest. Colugos are threatened by habitat destruction. Their lowland forest habitats are being felled and hunting also has also negatively impacted their populations. Colugus have unique incisor teeth, they have a comb-like texture and shape and each tooth has numerous grooves in it. The reason for this unique tooth structure is not yet understood. Colugos are placental mammals but they are also similar to marsupials in some ways. The young are born after a 60-day gestation period and are tiny and not yet well-developed. During the first six months of their life, they cling to their mother's belly for protection as they grow. The mother curls her tail to hold the young colugo as she glides. Sunda flying lemur (Galeopterus variegates) - The Sunda flying lemur inhabits the tropical forest in Southeast Asia including Thailand, Indonesia, Malaysia and Singapore. Sunda flying lemurs are nocturnal arboreal mammals that feed on plant material including shoots, fruit, flowers and leaves. There are four living subspecies of Sunda flying lemurs and are distinguished by their range (one lives in Java, another in Sumatra, one in Borneo and another in Malaysia and Mainland Southeast Asia). Philippine flying lemur (Cynocephalus volans) - The Philippine flying lemur, also known as the kagwang, is endemic to the Philippines where its populations are centered near Mindanao and Bohol. Philippine flying lemurs inhabit lowland and montane forests. Philippine flying lemurs are folivores, which means their diet consists mainly of leaves, fruits, flowers and buds. Philippine flying lemurs are arboreal and forage primarily in the treetops. They rarely come down to the forest floor to move about or forage.